Thyroid disorders can cause literally dozens of health and behavioural problems in dogs, but they frequently go undiagnosed or are misdiagnosed. My first experience of canine thyroid disease was with Chappie many years ago. When we got him from the rescue, we were warned that he was boisterous – but this wasn’t our experience. He wasn’t boisterous at all. Luckily we had a vet who suspected thyroid disease and arranged a blood test. Chappie lived, despite his thyroid problem, to the grand age of 17. We now have another dog with thyroid disease. We were first alerted to the potential of this when Freddie developed food sensitivities, which manifested as recurring ear infections and a swollen head. Food sensitivities can cause cyclical ear infections, and both are signs of thyroid problems. Freddie can also be moody. He’s a beautiful soul, a lovely person, but even since puppyhood, he has occasionally become fractious. He was also given the temporary name of ‘Laid Back’ by his breeders: sometimes he’s quite lethargic. When I arranged the blood test for Freddie, my vet asked me why I thought he might have thyroid problems. My answer was that I don’t think he has, I just want to check whether he has. Sure enough, when the test came back from Dr Jean Dodds’ lab – Hemopet – it confirmed my suspicions. I can’t help thinking that Freddie’s thyroid condition might have gone undiagnosed if I hadn’t been aware of the symptoms. Up to 80% of canine hypothyroidism results from an inherited autoimmune condition known as autoimmune (lymphocytic) thyroiditis, which progressively destroys the thyroid gland. This is serious. Lethargy * weight gain * mental dullness * cold intolerance * exercise intolerance * mood swings * neurological signs (polyneuropathy, stunted growth, seizures) * chronic infections * hyper-excitability * knuckling or dragging of feet * stiffness * muscle wasting * laryngeal paralysis * facial paralysis * head tilt * ‘tragic’ expression * drooping eyelids * incontinence * ruptured cruciate ligaments * dry, scaly skin and dandruff * chronic offensive odour * coarse dull coat * hair loss * rat tail * oily skin * darkening of the skin * pyoderma or skin infections * reproductive disorders * slow heart rate * cardiac arrhythmia * cardiomyopathy * constipation * diarrhoea * vomiting * blood disorders (bleeding, bone marrow failure) * eye diseases * IgA deficiency * loss of smell * loss of taste * endocrine disorders such as chronic active hepatitis. The classical signs associated with hypothyroidism (significant weight gain, lethargy, cold intolerance, poor skin and hair) typically occur only after 70% or more of the thyroid tissue has been destroyed or damaged. Other signs, such as unexpected behaviours including lack of focus, aggression, passivity and phobias, subtle weight gain despite calorific restriction, and apparent food hypersensitivity or intolerance, can present themselves during the early phase of the disease. Other behaviours associated with thyroid disease in dogs include whining, nervousness, schizoid behaviour (withdrawn, uncomfortable around others), fear around strangers, hyperventilating, disorientation, failure to be attentive, aggression, erratic temperament, hyperactivity, hypo-attentiveness, depression, anxiety, submissiveness, passivity, compulsiveness and irritability. Dr Dodds emphasises that we must look at breeding practices. “Since the 1800s, people have been continuously inbreeding and line-breeding … about 80% of canine hypothyroidism is the result of a genetically inherited autoimmune condition… This makes it even more important to accurately diagnose canine hypothyroidism in its early stages, so that affected dogs can be removed from the breeding pool and neutered. If you suspect your dog has a thyroid problem, see if you can get a full thyroid profile done. This is unlikely to happen in the UK, since few, if any, labs will do the T3 readings. I sent Freddie’s serum sample off to Dr Dodds’ lab in California. For the appropriate forms and instructions, see www.hemopet.com. Treatment is effective for thyroid disease. Conventionally it involves giving the dog a thyroid replacement tablet (Soloxine) twice daily. A second blood test needs to be done six months after starting treatment, and blood should be monitored at least annually thereafter, as the condition can change with age. Dr Dodds explains that whilst most vets will say the tablet should be given once a day, it’s actually important to give two doses twelve hours apart, and separated from food. Once the dog is diagnosed with hypothyroid disease, medication will be lifelong. Some people treat with desiccated thyroid glandulars, but it’s not always easy to get the correct dosage. Chappie was successfully treated homoeopathically (his blood readings normalised after two months on the remedy). However, I personally believe that although this might be a solution, you still need to continue to monitor the dog’s thyroid levels with regular blood tests. Unfortunately, my new vet thought I was nuts for sending serum over to California for analysis when, in his opinion, there are perfectly good labs in the UK. He also believed, looking at Freddie’s results, that he wasn’t hypothyroid – especially when Freddie looks incredibly handsome and healthy. I supplied further information and the vet is now on board. This, in fact, is the very reason for sending serum to Dr Dodds for analysis. She uses over 20 years’ cumulative data, from which she has established that the general range doesn’t apply to all dogs. Dr Dodds looks at each dog individually in relation to his size, age and breed. Healthy thyroid levels differ depending on these factors. It makes sense to me to pinpoint a thyroid problem before 70% of the thyroid is destroyed and the overt physical symptoms appear. Dr Dodds’ book, The Canine Thyroid Epidemic is written for dog owners and vets. 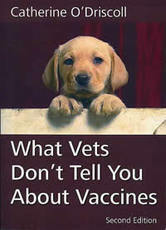 It’s easy to read and very informative – I’d recommend it to all dog owners. In fact, I’d go so far as to say that everyone who has dogs ought to have this book on hand. Apart from explaining the condition, it takes you through arranging a lab test, dealing with your vet, dietary considerations, and much more.